Our after-school programs have been a huge success! The Studio School and Aspen Ridge Prep School (Erie) are two fine examples. If your school program has been cut and you want your children to start instrumental ensembles so they will be ready for their groups in middle school and high school, call CAKE now and reserve your place in the instrumental music programs. How do we support school programs that still exist? The goal of Creative Arts for Kids' Enrichment is to support school music by providing students with some training before your programs start. This will help maintain the numbers required to continue middle school and high school programs in your county, programs that would be an enormous loss if they were discontinued. As always, CAKE remains dedicated to school music and welcomes requests from any of the local school music instructors. We have people who will come to your school and help with sectionals, special problems, and is always free to the schools. We're planning for summer already! Our summer orchestra and band programs for kids is designed to continue where the schools leave off at the end of May. Parents will love the educational value and kids will love the fun, the musical selections, camaraderie, and the totally awesome concert festival we will sponsor at the end. And the schools will love that their students practice over the summer—a huge boost to the quality of the next year's groups! Making music with friends is one of the best ways for our youth to spend a summer. Call 720.432.6873 today to reserve your place! CAKE--Creative Arts for Kids' Enrichment--is dedicated to serving all students. Whether you are looking for private lessons, beginner class lessons, early childhood music, or homeschool music courses, CAKE has a course for you. CAKE is also fortunate to offer several levels of adult ensembles through our "Livin' the Dream" program. We currently have three string orchestras--beginning, intermediate, and advanced--for players who are not quite ready for community orchestras or who want a smaller and more personal group. Our private teachers are highly educated and have years of experience teaching and performing. Several of them offer class lessons for those who are not quite sure if they want to make the commitment to private music study. If CAKE does not have a teacher for your specific instrument, we have a very long list of referrals and cooperative agreements with other studios in the area. So even if you don't see your instrument listed, call us anyway. We can help. 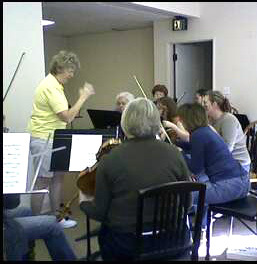 Beginning, intermediate, and advanced string orchestras for adults. Call for more information--it's too much fun to describe on a webpage! Junior Concert Strings for children 7 to 12: Must have basic reading skills. All stringed instruments welcomed. Orchestra 1: One year of in-school experience, private lessons, or permission of instructor. Woodwinds welcome! Orchestra 2: Two years of in school experience, private lessons, or permission of instructor. Woodwinds welcome! Metamorpheus: Advanced, conductorless student challenge ensemble based on the famed Orpheus ensembles in New York. Call for your blind audition to this democatic, student-led group. Three years experience and private lessons suggested. The WAVE Youth Jazz Combos: Beginning, intermediate, and advanced. Special combos available for adults. Guitar Starters: Not sure about guitar lessons? Try it out with little risk for eight weeks in a class designed to kick-start your music without breaking your budget. After eight weeks you can decide to continue in private lessons if you wish. Art & Math: Love math and want to see how beautiful it can be? Hate it and want to like it a little bit more? Either way, this is the class for you. Eight weeks of tesselations designed to open up neural pathways that tell you how beautiful numbers can be! To inquire about lessons at this music school, fill out the form below.